Or, shop local and pick up a copy at Mysterious Galaxy BookStore in San Diego, CA! "Where Dragonwoofs Sleep and the Fading Creeps is one of the finer works of epic fantasy I've come across in some time, ​and it's most highly recommended." "Massey delivers a powerful and entertaining story with his debut work of fantasy." "Where Dragonwoofs Sleep and the Fading Creeps will captivate young audiences with its unique blend of contemporary thrills and fantasy adventure." "This novel is the enchanting offspring of The Neverending Story and Alice in Wonderland. [...] A charming read with a satisfying plot twist and heartwarming conclusion." "Young adult readers take a foray into surrealism in this timely fantasy novel that alternates between middle school reality and an imaginary land to comment on contemporary themes and explore a common teen problem." "Where Dragonwoofs Sleep and the Fading Creeps" showcases author A. J. Massey as a master of the genre and a novelist with a genuine flair for originality and narrative driven storytelling." A.J. Massey writes thrilling fantasy novels for young teens and adults. His first book, Where Dragonwoofs Sleep and the Fading Creeps, blends shared dream worlds and middle school and was influenced by his favorite childhood movies of the 80s, Labyrinth and The Neverending Story. He currently lives in Southern California with his wife, Katie, and pet dragonwoofs, Abby and Peanut. 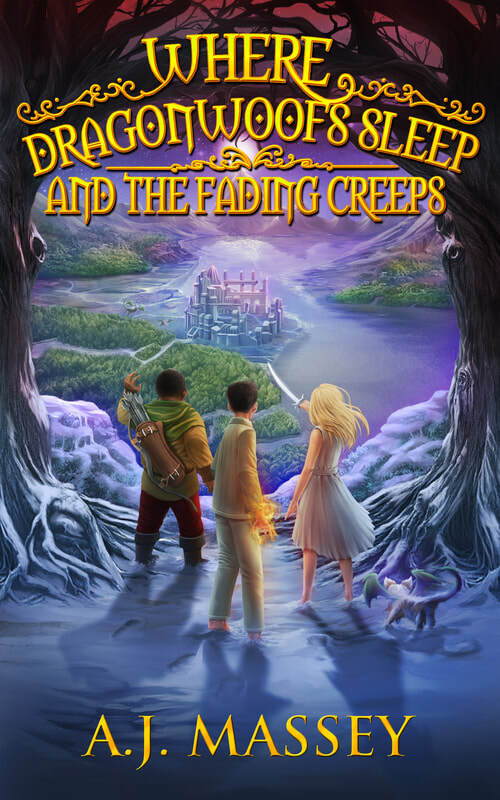 A normal eighth-grader by day, thirteen-year-old Ben awakens one night in a fantastical dream world where snow burns, the sun disappears and reappears without warning, and magic is addictive. But the mysterious realm of Meridia is disappearing, eaten by a phenomena called the Fading. Joined by Avery, Marcus, and three dog-like dragonwoofs, Ben journeys across monster-infested oceans and sun-scorched mountains to retrieve the sphinx's head, the key to saving the world and every astonishing creature that inhabits it.